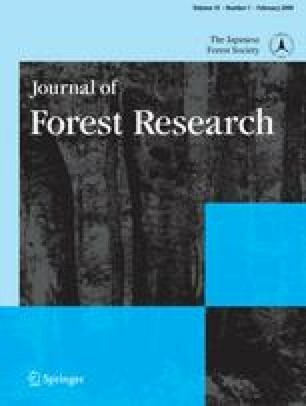 The pattern of changes in the physicochemical properties of wood, and its relationship with fungal succession during decomposition of coarse woody debris (CWD) of beech (Fagus crenata Blume) were investigated. In total, 47 snags and 66 logs were assigned to a system of five decay classes, and were used for analysis of the decomposition process. The decomposition process consists of two phases characterized by their dominant organic chemical constituents. In the first phase (decay class 1–3), acid-unhydrolyzable residue (AUR) and holocellulose decreased simultaneously. In the second phase (decay class 3–5), holocellulose decayed selectively. Fruiting bodies of ten fungal taxa occurred frequently on decomposing logs and/or snags. These fungi were divided into early and late colonizers according to their occurrence during CWD decomposition. The relationship between fungal community composition and the physicochemical properties of CWD was analyzed by canonical correspondence analysis (CCA). According to the Monte Carlo permutation test, decay class, water content, and type of CWD (log or snag) significantly affected the fungal community structure. Our results suggested that white-rot basidiomycetes, especially Omphalotus guepiniformis, play a central role in the simultaneous decomposition of AUR and holocellulose in the first phase of decomposition. On the other hand, fungal taxa occurring in the second phase of decomposition may not be responsible for the decomposition of holocellulose. Three possible mechanisms of holocellulose decomposition and AUR accumulation in the second phase of decomposition are proposed and discussed. The online version of this article (doi: 10.1007/s10310-008-0098-0) contains supplementary material, which is available to authorized users. We thank Tsutomu Hattori, Nitaro Maekawa, Yasuhisa Abe, Tsuyoshi Hosoya, and Hitoshi Neda for their helpful identification of fungi. We also thank Chisato Kobayashi, Seiko Saito, Yusuke Hagiwara, and Akihiro Shimizu, for their help with field work, and the members of the Laboratory of Forest Ecology, Kyoto University, for valuable discussion. We are grateful to Satoshi Yamashita for advice on statistical analysis. We also thank anonymous reviewers for providing valuable comments on the original manuscript. Financial support for this study was provided in part by the Research Fellowship Division, Japan Society for the Promotion of Science.